India’s ratification of the Paris Climate Change Agreement commits it to sweeping cuts in greenhouse gas emissions, and one of the pivotal channels for achieving those punishing targets is the instrument of solar power plants. India’s experience in this space illustrates how even vexing problems can be fixed with innovative thinking backed by political will. 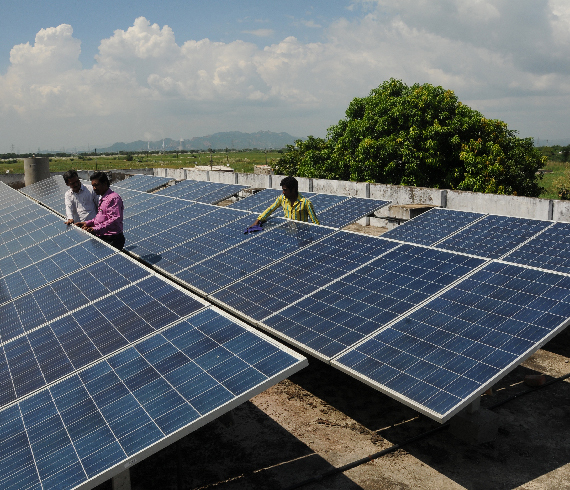 India has a good track record in solar power installations – 8 GW in six years, with a promise of another 8 GW in a year – but its record of rooftop solar plant installations is relatively poor. Against the target of 40 GW of rooftop installations by 2022 (which is part of the overall target of 100 GW fixed by the Central Government) India today has just 1 GW of rooftop plants. This is a serious failing. Since rooftop plants generate electricity right at the point of consumption, they do away with the need for transmission, which in turn cuts down on energy loss. Further, they give plant owners independence from utility companies and insulate them from tariff hikes. India’s potential in this space is huge. Installing rooftop solar plants at educational institutions and factory buildings alone would help generate 40 GW. India’s Ministry of New and Renewable Energy estimates the ‘market potential’ at 124 GW, though it says the ‘technical potential’ is much higher, at 352 GW. Electricity from rooftop plants will be cheaper than the power that educational institutions and factories procure from utility companies – and from the diesel-fired generators that come on during the frequent power outages. So why has rooftop solar not gained sufficient traction? The reason is the poor financial health of the utility companies. In India, most electricity utility companies are owned by provincial (State) governments. Political and social imperatives have led governments to provide power cheap, or even free, to the poor and to farmers. These losses are cross-subsidised by higher tariffs on commercial and industrial establishments. Even so, most of the utilities are broke. To hold on to their paying customers, the utility companies effectively disincentivise these establishments from installing rooftop solar plants – by refusing to buy any surplus power from them. In the southern State of Tamil Nadu, for instance, the distribution company (‘discom’) does not buy from rooftop solar plants of industries and educational institutions. Other States buy surplus power only up to a capacity cap, say, 1 MW. Being stuck with unsellable surplus power skews the economics of rooftop solar plants for these colleges and factories. “Discoms see rooftop solar plants as ‘competition’,” observes Ketan Mehta, CEO of Rays Power Infra, which owns solar power plants and builds plants for others. ‘Storage’ is an obvious answer, but it is still a costly proposition. The Central Government acknowledges that without 40 GW from rooftops, it would be impossible to meet the target of 100 GW of solar power by 2022. India has committed at the Paris Climate Change Conference to ensuring that by 2030, 40 per cent of energy consumed in the country will come from non-fossil fuel sources. This would require some 320 GW of renewable energy capacity, so rooftop solar has a key role, even beyond 2022. Upendra Tripathy, Secretary in the Ministry of New and Renewable Energy, says the government has promised to compensate discoms for any revenue loss. The bureaucrat did not specify this, but the funds for such compensations could come from the National Clean Energy Fund, which has been formed by collecting a tax on every tonne of coal mined or imported. There are also suggestions from the industry that rooftop plant owners could be asked to pay the utilities a fee. Alongside all this, the federal government is also looking to provide funds to State governments and cheaper loans for discoms. Given the manifest seriousness in the government’s intentions, hopes run high that the rooftop solar programme will see more dramatic growth. The cloud cover over the industry, and over India’s contribution to climate change mitigation, is lifting, and a sliver of sunlight is streaming through.